Calling all Potterheads – if you’ve dreamt of stopping by number 4 Privet Drive, stashing your Galleons in Gringotts, or trying to find Grimmauld Place, now’s your chance. 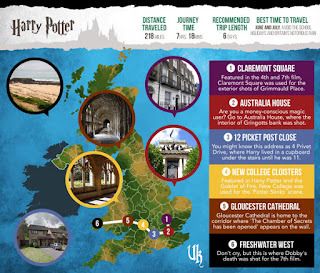 Armed with a handy road map (no need to make any solemn swears to be able to read this one) you can journey across southern England and to the west coast of Wales to see your favourite places from the films… And the spot where Dobby died. Start in Claremont Square, which will be familiar for members of the Order of the Phoenix. Head over to Australia House to pick up your Sickles and Knuts, so you can buy a few Every Flavour Beans for the journey. Have a quick nap under the stairs at 12 Picket Post Close. Make your way to your next Potions class through the New College Cloisters. Spread rumours about the heir to Slytherin when you hear about the Chamber of Secrets at Gloucester Cathedral. Finish off by bawling your eyes out at the spot where Dobby went to the great Society for the Promotion of Elfish Welfare in the sky. Accio fun times – it’s more than just a map, it’s also a quick reference for distance, approximate journey time, and recommendations on how long to take over it and when to go. All you have to do is book the time off (and the hotels, unless you want to sleep in the car). Journey times by broomstick or apparating aren’t included. So if you want to be a Potter spotter, or just fancy a magical holiday, have a look at AttractionTix.co.uk’s guide to Harry Potter hotspots here.